I hear so many of my friends talk about how they get bored with making the same things over and over. I, too, can get in a kitchen rut from time to time, but the best way we can keep that from happening is to try new and exotic dishes from far away lands. I know, I know, you are thinking "Yeah, but I don't want to have to spend a fortune on fancy seasonings and special tools." Well, if you have discovered anything at all about me, you will know I am not about expensive seasonings OR fancy tools. You can try many exotic meals with what you have in your pantry already! 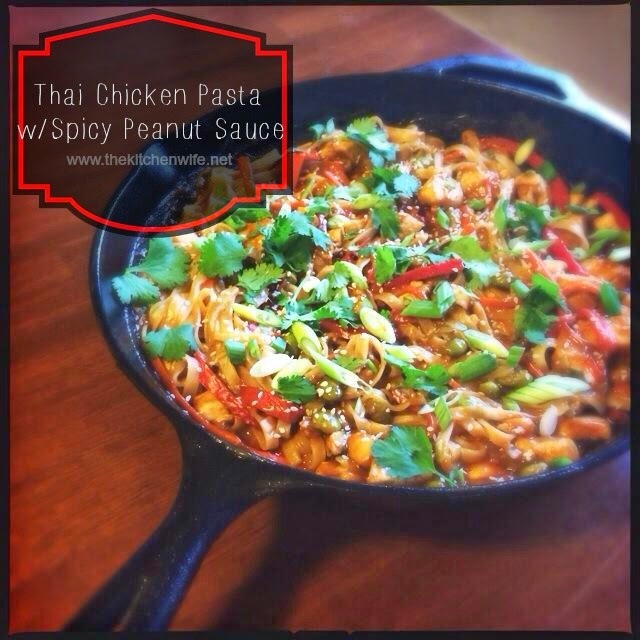 One of my favorite dishes to do that with is this Thai Chicken Pasta w/a Spicy Peanut Sauce! Let me show you how I do it! It is important that it is SALTED water. Why? Because this is the only time you have to season that actual pasta. The key to successful Asian cooking is preparation. cube your chicken, and make your sauce. Let me show you how to make the sauce. In a bowl (yes, I started in a mixing cup, but had to put everything in something bigger), combine the soy sauce, vinegar, brown sugar, peanut butter, sriracha, garlic, ginger, and salt and pepper. Depending on your flavor preference, you will want to taste and make any adjustments you desire. By this time our water should be boiling and you can add your noodles. Now, I used rice noodles, but if you don't have rice noodles, NO WORRIES! Just use spaghetti, linguine, fettuccini, heck, bow ties (farfalle) would even work here. WHATEVER you have will be great! Once you have everything prepped and ready to go, you can heat your skillet. You are going to want this skillet to be HOT, SMOKING HOT! Asian cooking is all about high temps and fast cooking. Add your oil, or in my case butter. Now put your chicken in the skillet and salt and pepper. You will let the chicken cook through and brown. This will take 3-4 minutes. When your chicken is finished cooking, remove from the pan and set aside. Now you will add the carrot. Give it time to soften and begin caramelize. This will be about 2 minutes. HALF of the Scallions. These will only go for about a minute. Return the chicken to the pan and toss everything together. Now it is time to add the sauce. Now you will turn off the heat and add your noodles. the other half of the scallions, some sesame seeds, or crush peanuts. There you have it, a DELICIOUS and fun meal from the Far East that you can make with things you have in your pantry at home. When you bring this to the table you are expanding the pallets of your picky eaters (hey, it has peanut butter in it), learning how different cultures eat (pick up some chopstick from your local Chinese take-out place), and creating memories around your table be it with the kids, with that special someone, or just you at home alone. Give this easy, Asian dish a try tonight. Put pot of salted water on high heat, and bring to boil. In a mixing bowl combine soy sauce, rice wine vinegar, brown sugar, peanut butter, sriracha sauce, garlic, and ginger. Place skillet or wok on stovetop over high heat. When skillet is HOT, add 2-3 tbsp. canola oil. By this time the water should be at a boil. Add the rice noodles. To the hot skillet you will add the chicken. Salt and pepper chicken and let cook through and brown. When chicken has cooked through and is brown, remove from pan. To the hot skillet, add the carrots and let caramelize, about 2 minutes. Next, add the red pepper and let soften. Then add the edamame and HALF of your scallions. Cook until tender, about 2 minutes. Now return the chicken to the skillet and toss. Pour the peanut sauce over the chicken and vegetables and stir together. Add the cooked rice noodles, drained, to the skillet and toss together. You can top with fresh cilantro, the other half of you scallions, sesame seeds or crushed peanuts. This is one of my favs as well! Thanks so much for reading!